"Israeli officials also pointed out that in 2006, Westerwelle opposed the participation of German intelligence-gathering ships and naval personnel in preventing a rearming of Hizbullah as part of UN Security Council resolution 1701 that put an end to the Second Lebanon War." But according to The Jerusalem Post newspaper, some in Jerusalem are concerned about Guido Westerwelle replacing outgoing Foreign Minister Frank-Walter Steinmeier. The 47-year-old Westerwelle was born after the Holocaust and as a member of a new generation of Germans, he did not have the same reflexive sympathy for Israel that has characterized other German leaders from the across the political spectrum. He joined the FDP as a teenager in 1980, rising swiftly through the ranks to become chairman in 2001 at just 40, the youngest leader amongst the big five parties in Germany. In 2002, a top FDP politician and head of the German-Arab society, Jürgen Möllemann, distributed flyers attacking former Prime Minister Ariel Sharon and Michel Friedmann, who at the time was vice president of the Central Council of Jews, the umbrella group of Jewish communities in the country. He accused Friedmann of fuelling the spread of anti-Semitism in Germany, likened Sharon’s military assault on Palestinians to the practices of the Nazis and attempted to justify Palestinian suicide attacks against Israel. Mölleman, considered as an anti-Semite, was accused of pandering to the extreme right to boost his party's chances in the elections. As the party’s head, Guido Westerwelle, failed to immediately distance himself from Möllemann and only after rising public pressure did he express regret about his attacks. Israeli officials also said that the FDP has been problematic regarding Iran, expressing opposition to sanctions against Teheran. Germany is Iran's largest European trade partner. According to The Jerusalem Post, Israeli officials also pointed out that in 2006, Westerwelle opposed the participation of German intelligence-gathering ships and naval personnel in preventing a rearming of Hizbullah as part of UN Security Council resolution 1701 that put an end to the Second Lebanon War. "It seems that these NGOs and European governments are responsible for this latest attempt to undermine the legitimacy of the state of Israel and to aid those who would seek to destroy it." "Following up my earlier item, Westminster Magistrates court in central London on Tuesday evening rejected a petition to issue an arrest warrant for Israeli Defense Minister Ehud Barak on the grounds that he committed "war crimes" by defending Israel from Hamas attack. The British government intervened on Barak's behalf, submitting legal briefs to the court, and thus avoiding what would have been the most serious clash between Britain and Israel since 1948. It seems that these NGOs and European governments are responsible for this latest attempt to undermine the legitimacy of the state of Israel and to aid those who would seek to destroy it. "Donors include the NGO Development Centre (NDC - Switzerland, Denmark, Sweden, the Netherlands), Norway, Open Society Institute (OSI), Medico International, Ford Foundation, Diakonia, Trocaire, European Commission." Foreign Minister Avigdor Lieberman accused Norway last week of upholding anti-Semitic and anti-Israeli policies, Army Radio reported Tuesday. Lieberman fiercely criticized the Norwegian government during the UN General Assembly in New York, demanding answers from Norwegian Foreign Minister Jonas Gahr Støre regarding talks Oslo had been holding with Hamas. He then brought up what he termed Norway's quiet support of Mahmoud Ahmadinejad, stating that Norwegian representatives to the UN did not leave the room during the Iranian leader's New York speech. Lieberman also mentioned the Norwegian Culture Ministry's commemoration of Nazi-affiliated author Knut Hamsun, who had once eulogized Hitler in the Norwegian daily Aftenposten as a "warrior for mankind." 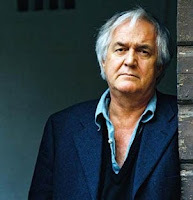 In response, Støre denied the allegations of anti-Semitism, explaining that the commemoration was not political in nature and that a distinction was made between Hamsun's work and his world view. However, former Foreign Ministry director-general Alon Liel told Army Radio that "Norway is trying to send us messages on different fronts" through its talks with Hamas and "intolerance toward settlements." "They are tough Vikings and are not intimidated, not even by Lieberman," concluded Liel. "[Norway] is an ideological opponent who has decided to teach us a lesson." Lieberman first voiced his criticism of Norwegian policies in August, after a newspaper in neighboring Sweden published a controversial article accusing Israel of organ harvesting. "We hope that the Department of Energy will make clear to its Spanish partners its strong disagreement with this decision. And if Spain does not permit the Israeli team to participate, consider withdrawing its sponsorship from the competition." NEW YORK (EJP)---The Anti-Defamation League (ADL) has contacted the US Department of Energy (DOE) and the government of Spain in an effort to have the disqualification of Israeli researchers from an international competition in Madrid overturned. Although the team of researchers from Ariel University Center of Samaria was announced as a finalist in the Solar Decathlon Europe, the Spanish government has disqualified the team from competing, apparently because the institution is located in the West Bank. "The decision by the Spanish government to disqualify the Israeli researchers is unwarranted, biased and clearly discriminatory," said Abraham H. Foxman, ADL’s national director, in a statement. "This unacceptable action introduces politics into an important scientific competition where politics has no place," he said. Established through a joint agreement between the DOE and Spain’s Ministry of Housing, the competition has teams from around the world contending to build a solar-powered house. The prototypes will be assembled in Madrid and judged in June 2010. In a letter to Spanish Foreign Minister Miguel Angel Moratinos, ADL said his government’s claim that participation by the Israeli team would violate European Union policy relating to the West Bank was "spurious." "We are unaware of any EU policy that would support this action," ADL wrote to Moratinos. "Respectfully, we urge Spain to reverse this outrageous decision." ADL also called on the US Department of Energy to reconsider its sponsorship of the competition should Spain refuse to reverse its decision. "We hope that the Department of Energy will make clear to its Spanish partners its strong disagreement with this decision. And if Spain does not permit the Israeli team to participate, consider withdrawing its sponsorship from the competition," the League said in a letter to US Secretary of Energy Steven Chu. The first Solar Decathlon Europe Competition takes place in Madrid in June 2010 with the participation of universities from Europe, America and Asia. It's a competition organized by the US Department of Energy for universities to design and build a self-sufficient house using solar power as the only source of energy. The final phase of the competition takes place in the National Mall in Washington D.C., where the universities compete by undergoing 10 contests. Source: Norway, Israel and the Jews : NTNU seminars on the Middle East – based on research or bias? NTNU [Norwegian University of Science and Technology], a prestigious Norwegian university, is this autumn offering a series of seminars on the Middle East. Seeing as how it’s NTNU one would normally expect only the best. Yet the series of seminars as a whole appears rather unbalanced. Clearly we will hear the Palestinian narrative, but who is there to provide the audience with Israel’s perspective? The fact that Ilan Pappé is Jewish is certainly no guarantee. Seminar 1: Violations of international law, humanitarian rights and the Geneva convention in the wars of the Middle East? By senior researcher Cecilie Hellestveit, Norwegian Centre for Human Rights, University of Oslo. "Throughout history Allah has sent people against the jews in order to chastise them for their corruption. The last chastisement was implemented by Hitler. By all what he did to them, even if they have exaggerated this matter, he managed to put them in their place. This was divine punishment for them. By the will of Allah, next time this will happen by the hands of the faithful." Cecilie Hellestveit disagreed with Aftenposten’s translation. In an article in Morgenbladet the following week, she claimed that Qaradawi’s statements had been interpreted "out of context" and that read properly, Qaradawi’s statement "... is clearly rhetorically closer to JFK’s Ich bin ein berliner than with Hitler’s Der ewige Jude". While translations often will be contested, and rightly so, the difference between Aftenposten’s and Hellestveit’s interpreations is vast and certainly ought to be examined more thoroughly. In a letter to the following edition of Morgenbladet, this is what psychologist Ragnar Kværness does, asking: "What makes a peace researcher – attached to Center for Human Rights – attempt to make hateful extremists such as Qaradawi into what she calls "wise old men in wheelchairs'?" While this one incident certainly does not make Cecilie Hellestveit unfit to speak at an NTNU seminar, it does make it obvious that her presence needs to be balanced by the presence of speakers who are less accommodating of Israel’s enemies. Seminar 4: Ethnic cleansing of Palestine – a premise for the construction of Israel? By Professor Ilan Pappé, University of Exeter. Ilan Pappé is increasingly popular in Norway, as we noted in this post. Yet his perspectives on the war of 1948 are hugely contested, not least by Israeli historian Benny Morris who is internationally recognized as being one of the leading authorities on the refugee crisis of 1948. The difference between the two is basically that while Mr. Pappé regards the Naqba as the direct consequence of a willed and planned ethnic cleansing which the Arab states attacked in order to stop, Mr. Morris sees the Naqba as the unintended consequence of an Arab war of aggression. These two different interpretations of the same event set the state of Israel in two vastly different roles. In selecting Ilan Pappé as a speaker NTNU is providing one of the interpretations with legitimacy, while completely disregarding the other. How is this justifiable? Seminar 6: One state, two states or federation – solutions to the conflict in the Middle East? Director Nils Butenschøn, Norwegian Center for Human Rights, University of Oslo. When Nils Butenschøn ran for leadership of Palfront in 1976, he did so with the intention and strategy of winning "entire parties and organizations for Palestine" (here). In the words of Tarje Vågstøl’s dissertation on the history of the Palestine Movement in Norway: "The strategy was to start 'at the left' with NKP (Communist Party of Norway) and SV (Socialist Left), and then move towards the union movment and Arbeiderpartiet (Labor)". Vågstøl also narrates how Mr. Butenschøn laundered money for the PLO, telling of "... an intricate system which involved suitcases filled with thousand-kroner notes, all so the money could not be traced to the PLO". Mr. Butenschøn furthermore arranged a meeting between the PLO and the Black Panthers. Regarding the exact topic of Mr. Butenschøn’s NTNU seminar: "One state, two states, or federation", his stance is exactly what it was when he introduced it to Norges Unge Venstre – a replication of that of Arbeiderpartiets Ungdoms Fylking’s (Labor Youth Wing) "… a progressive Palestinian state where all ethnic groups can live side by side under full equality". While Mr. Butenschøn has every right in the world to his views on how Israel should solve her problems, it must be evident from his personal history that he is a dedicated defender of the Palestinian cause more than an objective academic. NTNU presents the seminars with the following words: "It is difficult to fashion a consistent, well funded and coherent understanding of the field (The ME conflicts). Media will never be the venue for deep thought and research-based deliberation. Thorough contemplation is something the universities must assume responsibility for. This is a contribution from NTNU". If NTNU seriously can present the above-mentioned as speakers for a balanced seminar-series, we would very much like to see how a pro-Palestinian, anti-Israel seminar-series would look like. NTNU’s rector Torbjørn Digernes would be well advised to have a closer look at what passes for "research-based" at his university. "Earlier this week, the European Union presidency issued a statement condemning Ahmadinejad for his statements on the Holocaust and on Israel, saying such remarks "encourage anti-Semitism and hatred"." With such lack of coherence, no wonder there is huge disapppointment in Europe with the EU. It is impossible to know what Europe really stands for. STOCKHOLM (AFP-EJP)--- Sweden, the country which chairs the EU, Finland and non-EU Norway stayed in the room when Ahmadinejad spoke at the UN. Iranian President Mahmoud Ahmadinejad did not cross the "red line" that would have prompted a walkout by all EU states in his speech at the United Nations, the Swedish foreign ministry said Thursday. "There were certain criteria set for when the EU would leave the room and those criteria were not fulfilled," spokeswoman Cecilia Julin said. Sweden currently holds the rotating EU presidency. The criteria agreed in New York before the Iranian leader spoke included denying the Holocaust and calling for the annihilation of Israel, which Ahmadinejad avoided doing this time. Even so, a number of EU states did walk out when Ahmadinejad attacked Israel, including Britain, Denmark, France, Germany, Hungary and Italy. "We're not commenting on who left or who didn't leave," Julin said. "I think there were other reasons for other countries that decided to leave." In his address, Ahmadinejad again took aim at Israel but without mentioning the country or Jews by name, referring only to the "Zionist regime." He accused Israel of "inhumane policies in Palestine," including genocide, and seeking to "establish a new form of slavery, and harm the reputation of other nations, even European nations and the US, to attain its racist ambitions." Suggesting there was a Jewish conspiracy, Ahmadinejad added: "It is no longer acceptable that a small minority would dominate the politics, economy and culture of major parts of the world by its complicated networks." He accused Jews of seeking to "establish a new form of slavery and harm the reputation of other nations, even European nations and the US, to attain its racist ambitions." Israel had called for a boycott of the speech, and was not present when the Iranian leader spoke. Canada heeded the boycott call, while delegations from Argentina, Australia, Costa Rica, New Zealand and the United States also left the room as Ahmadinejad began to rail against Israel, a European source said. Earlier this week, the European Union presidency issued a statement condemning Ahmadinejad for his statements on the Holocaust and on Israel, saying such remarks "encourage anti-Semitism and hatred". "About a week ago, I visited Israel and Palestine. I was part of a delegation of authors with representatives from different parts of the world. We came to participate in the Palestinian Literary Festival. The opening ceremony was supposed to take place at the Palestinian National Theatre in Jerusalem. We had just gathered when heavily armed Israeli military and policemen walked in and announced that they were going to stop the ceremony. When we asked why, they answered: You are a security risk. What I saw during my trip was obvious: the state of Israel in its current form has no future. Moreover, those who advocate a two-state solution have not got it right." "Swedes think Norwegians are a bunch of undisciplined cowboys. Meanwhile Norwegians see Swedes as being overly prim-and-proper and obsessed with going by the book. This prejudice is not entirely unfounded. Norway was never feudal the way Sweden was, neither was Norway industrialized, nor was Norway ever a military power as Sweden was. In short, Obedience was never beaten into Norwegians the way it was in Sweden. The political consequence is that Sweden does not challenge its political establishment but sticks to the Social Democrats (and every now and then the Moderates). Meanwhile in Norway’s 2009 election (Yesterday) the Progress Party got 22,9 percent of the votes. Troubling as the situation in Norway may be, it is generally worse over in neighboring Sweden – they are fearful of questioning authority. "Foreign Minister Avigdor Lieberman managed to tacitly draw the attention to—you guessed it!—the Holocaust [...] Lieberman’s Swedish counterpart Carl Bildt blatantly refuses to cave in [...] Ostensibly, Israel is using the article to get a message across: Sweden is an anti-Semitic country. They are set to pressure the Swedish government until it condemns the ‘blood libel accusation’. All of a sudden everyone is discussing good old anti-Semitism instead of Israel’s state terrorism and its apartheid policies towards the Palestinian people." The usual suspects immediately cried "anti-Semitism," claiming that the old blood libel accusation has been brought to life again.2 The Israelis have even threatened to sue him. Such reactions were anticipated, however. Innumerable hate mails have found their way into Mr Boström’s inbox since the publication, including death threats. More surprising is that Sweden’s ambassador to Israel, Elisabet Borsiin Bonnier, issued a condemnation of the article. It was "as shocking and appalling to us Swedes as to Israelis," the ambassador claimed in a press release that was later withdrawn, having attracted criticism from the Swedish foreign ministry as well as from the government. Lieberman’s Swedish counterpart Carl Bildt blatantly refuses to cave in: "As a member of the Swedish government, acting on the Swedish constitution I have to respect freedom of speech, irrespective of the personal views that I might have." His boss, Prime Minister Fredrik Reinfeldt, also rejects commenting on the article. Bildt is expected in Israel in about a week’s time, but Israelis are threatening to cancel his trip. Despite all the fuss, this isn’t the first time Donald Boström publicly vents suspicions about Israelis stealing organs from Palestinians. One chapter of the book Inshallah: konflikten mellan Israel och Palestina ("Inshallah: the Conflict between Israel and Palestine"), edited by Boström and first published in 2001, was an account of what happened to a 19-year-old Palestinian boy. It includes the photo now published in Aftonbladet. Donald Boström decided to shed new light on the affair following the mass arrest in New Jersey of people involved in illegal organ trade that included a shockingly high number of Rabbis. SMEAR CAMPAIGN AGAINST SCANDOS! ISRAELIS POKE FUN! Unfortunately (predictably), no such reservations and concerns about the Goldstone Report were voiced either by the European Union or by European governments. The United States expressed grave reservations Thursday with the findings and recommendations of a UN report that accused Israel of war crimes during the Gaza conflict and left open the possibility of prosecution at The Hague. "We have very serious concerns about many recommendations in the report," Ambassador Susan Rice, the permanent US representative to the UN, told reporters following a closed Security Council meeting. 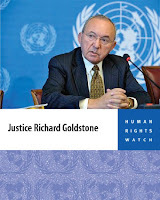 The nearly 600-page report, presented on Tuesday by South African Judge Richard Goldstone, accused both Israel and Hamas of war crimes and possible crimes against humanity, and recommended that if no appropriate independent inquiry takes place in Israel within six months, the Security Council should refer the matter to prosecutors at the International Criminal Court. Several members of Congress issued sharp condemnations of the Goldstone Report, which they said ignored Israel's need to defend itself against terrorism. "In the self-righteous fantasyland inhabited by the authors, there's no such thing as terrorism, there's no such thing as Hamas, there's no such thing as legitimate self-defense," Rep. Gary Ackerman of New York, the chairman of the House Subcommittee on the Middle East and South Asia, said in a statement. "Certainly, the United States should do all that it can to ensure as little time as possible is wasted on this distraction from the real work of making peace," he said. In a similar vein, a joint statement by Reps. Shelley Berkley of Nevada and Eliot Engel of New York staunchly defended Israel's right to defend itself against rocket and mortar attacks from the north and the south. "Israel took every reasonable step to avoid civilian casualties," they wrote. "It is ridiculous to claim that Israel did not take appropriate actions to protect civilian populations." - Goldstone Report: 575 pages of NGO "cut and paste"
Why did Ken Loach boycott Melbourne and not Cannes ? "Why Melbourne and not Cannes? Perhaps because Cannes is a large film festival with an extensive media exposure and the financial issues are too important for even such a committed filmmaker as Ken Loach to ignore, whereas Melbourne is a small film festival where it is easy to play the militant game and perform a great lesson-giving act." Ken Loach is free to screen his film where he pleases. It is also his right to protest against the State of Israel and its occupation policies. The problem is the method chosen. For if one follows the Loach's logic, it is reasonable to question the filmmaker's decision to boycott the Melbourne Festival and not, for example, the last Cannes Film Festival where he came to present the same film, Looking for Eric. Indeed, five Israeli films (three long and two short films) were screened at Cannes this year. All supported by Israeli public funds and whose presence at the festival was also supported by institutions in the country. Why Melbourne and not Cannes? Perhaps because Cannes is a large film festival with an extensive media exposure and the financial issues are too important for even such a committed filmmaker as Ken Loach to ignore, whereas Melbourne is a small film festival where it is easy to play the militant game and perform a great lesson-giving act." - Marxist Film Director Says Antisemitism is "Understandable"
The University of Tromsø has 9000 students and is known in Norway as the “peace university.” It was a leading force in Norway during the massive boycott of the Apartheid regime in South Africa. The city of Tromsø has a twinning relationship with the city of Gaza and inhabitants of Tromsø turned out in good numbers for a Gaza demonstration in January. 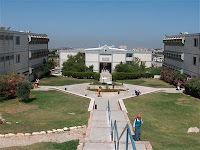 The boycott call comes at the same time that the Norwegian University of Science and Technology (NTNU) in Trondheim has begun a series of lectures on the Israel-Palestinian conflict. The lectures are supposed to build a “broad perspective.” The list of speakers includes the American Stephen Walt and the Israelis Ilan Pappe and Moshe Zuckerman. The latter claimed initially on German radio that 400,000 people were killed during Operation Cast Lead. These names and those of several Norwegian anti-Israeli lecturers leave little doubt about the pro-Palestinian thrust of the series. NTNU is one of Norway’s most prestigious universities. This autumn the university is presenting a series of seminars on the Palestine-Israel conflict where all of the speakers, as well as the members of the organizing committee, are known adherents of the Palestinian narrative. Why is the Israeli narrative not given equal attention? Is Israel so fundamentally evil that her perspective is irrelevant? NTNU rector Torbjørn Digernes says that all speakers at the seminar are required to be objective, and that he as rector stands by the decision to host the seminars. PARIS (EJP)---Jewish organisations have denounced the sale over the weekend at a French Communist Party annual event of protection masks against the H1N1 swine flu marked with the mention “State of Israel.Criminal State." In a statement, the National Bureau of Vigilance Against Anti-Semitism and the Councils of Jewish Communities of Seine-Saint-Denis condemned the initiative taken at the "Fête de l’Humanité" or Festival of Humanity, and particularly the sale by a Communist municipal councilor [Madjid Messaoudene] from the Paris suburb city of Saint-Denis, of anti-Israel masks. T-shirts emblazoned with “Stop the Capitalist Flu” could also be seen at the stand [photo]. "This type of initiative is likely to lead to anti-Jewish acts," the organisations warned, recalling the fact that after an anti-Israel demonstration in Saint-Denis earlier this year nine petrol bombs were thrown against the local synagogue. The Jewish groups demanded that security measures be taken around Jewish worship places in view of the High Holidays of Rosh Hashanah, the Jewish New Year, and Yom Kippur. In their statement, they also called on French Interior Minister "to use his authority so that elected officials of the Republic and in particular those of the Communist Party stop misusing their mandate to accuse and insult the Jewish state by inciting to hatred of Israel which leads to anti-Jewish act." This year 600,000 people attended the Communist Party event at a huge park in the north of Paris near the suburb of La Corneuve. "In the 1930s [...] a growing convergence of German and Arab enmities allowed Nazi-style anti-Semitism to penetrate the Arab world. [...] Although early in the Third Reich, a Jewish homeland in Palestine was, in fact, thought of as a convenient dumping ground for Europe's Jews, soon, a covenant between anti-Zionist Arab leaders and the Nazis began to emerge. Leaders on both sides chose to finesse or ignore the implications of the kind of anti-Semitism featured in "Mein Kampf". An article in the Nazi Party newspaper, published in 1937, explained that Arabs had been at least partly "Aryanized" through mixing with Armenians and Circassians." "[...] One important lesson of the past year is that Israel should have taken the Palestinian incitement to hatred seriously, and America should have paid more attention to bin Laden's declaration of war against the West. Words count. Portraying Jews as a demonic people aimed at destroying Islam and enslaving mankind may be a warning that the deployment of weapons of mass destruction against Israel is not an unimaginable next step. For hundreds of years, the virulent form of anti-Semitism that is now endemic in the Islamic world has been the heritage of the Christian West. In Christianity, the Jews had a starring role: they were the killers of Christ, and some Christians believed that they reenacted this ultimate evil by drinking Christian blood every Passover. In Islam, the Jews were more like shlemeils than God-slayers: the Jewish tribes in Arabia opposed Muhammad, but he easily defeated them. Although the Koran contains numerous harsh statements about Jews, the bottom line in Islam was that Jews were protected under Islamic law as long as they accepted Islamic political authority and the social and political limitations this imposed. Prejudice against Jews existed, and at periods of turmoil this prejudice sometimes turned violent, but eras of cooperation and relative peace were also often characteristic of Jewish life under Islam. Anti-Semitic ideas infiltrated into the Arab world, according to Bernard Lewis, one of the greatest living scholars of Islamic history, as Islam expanded into the West. Christian converts to Islam and Greek Orthodox Christians who found themselves living under Islamic rule introduced anti-Semitism, including the notion of the blood libel, into the Middle East. In the first half of the 19th century, Christian Arabs, who were in continuous contact with Western Christians, brought numerous blood libel charges against Jews living in the Ottoman Empire. Often, money was at the root of this evil. In many cases, the Jews were the Christians' business competitors. Attempts to inflame Arab passions against the Jewish minority "were actively encouraged by Western emissaries of various kinds, consular, commercial, priests and missionaries," writes Lewis, in his book "Semites and anti-Semites", and blood libels were often accompanied by calls for commercial boycotts. In the 1840 Damascus blood libel, the most famous of such cases in the Arab world, it was Capuchin monks who made the false accusation, backed energetically and vociferously by the French consul. Interestingly, Islamic political authorities often attempted to quell the blood libel accusations, and Islamic intellectuals attacked Christian prejudice on the pages of newspapers and journals. In the 1930s, nearly two decades after the Balfour declaration aroused further Arab suspicions and hostilities, a growing convergence of German and Arab enmities allowed Nazi-style anti-Semitism to penetrate the Arab world. Although technically the Arabs were also "Semites" disdained by the Nazis, both the Germans and Arabs had hatred of the British and the French in common. To the top of this list was added the Jews. Although early in the Third Reich, a Jewish homeland in Palestine was, in fact, thought of as a convenient dumping ground for Europe's Jews, soon, a covenant between anti-Zionist Arab leaders and the Nazis began to emerge. Leaders on both sides chose to finesse or ignore the implications of the kind of anti-Semitism featured in "Mein Kampf". An article in the Nazi Party newspaper, published in 1937, explained that Arabs had been at least partly "Aryanized" through mixing with Armenians and Circassians. While some Nazis even argued that "Mein Kampf" should be emended to make clear that only Jews and not Arabs were meant as objects of Hitler's rage and disdain, the sacred text did not bear emendation. The Nazis used radio broadcasts to propagandize in the Arab world. Attacks on their common enemy, the Jews, were a major feature of these broadcasts. At the same time, Hajj Amin al Husayni, the mufti of Jerusalem and leader of the Palestine Arab Higher Committee, obsessively pursued links with fascist Italy and Nazi Germany and lived out the war years in the Axis countries. Amin's long term goal, he said, after preventing Jewish settlement of Palestine, was to lead, in alliance with Germany, a Holy War of Islam against world Jewry that would result in the final solution to the Jewish problem. "At a time when the world mourns the terrorist massacre in the Russian town of Beslan, the Swedish state agency for foreign aid, SIDA, is subsidizing a conference aimed at finding ways to fund Palestinian terrorism. The "Palestinian Solidarity Conference", scheduled to be held in the Gothenburg municipality Culture House starting September 7, culminates in a celebratory party on the night of September 11 – while the rest of the world finds other more sober ways of marking the anniversary of this turning point in the impact of terrorism." Remember the 2004 "Palestinian Solidarity Conference" in Gothenburg, Sweden ? When you examine what the Palestine lobby says and does, and then look back a bit in time and see what they have said and done in the past, you quickly find that there is no real difference. Operation Cast Lead didn’t really change anything – the Palestine lobby were just as critical of Israel before. The 2006 war in Lebanon, which upset our dear Jostein Gaarder [Norway up in arms after author asserts Israel has lost right to exist] so, didn’t really change anything – the Palestine lobby was just as furious before that again. Here’s a snippet from 2004, on the "Palestinian Solidarity Conference" in Gothenburg, Sweden. Read the whole piece here. Now 2004 is five years ago now. Yet hate-mongers have been hard at work for a long time, 2004 was just yesterday. At a time when the world mourns the terrorist massacre in the Russian town of Beslan, the Swedish state agency for foreign aid, SIDA, is subsidizing a conference aimed at finding ways to fund Palestinian terrorism. The "Palestinian Solidarity Conference", scheduled to be held in the Gothenburg municipality Culture House starting September 7, culminates in a celebratory party on the night of September 11 – while the rest of the world finds other more sober ways of marking the anniversary of this turning point in the impact of terrorism. One of the main conference agenda items is action to remove the PFLP, Hamas and other terrorist organisations from the EU’s terror list, so that these organizations can resume collecting money in Sweden and other European countries. Another agenda item is promoting a total boycott of Israel and other sanctions against the Jewish state. A third is developing strategies to explain the need for "armed resistance" (i.e. terrorism) in the struggle. The conference is being organized by the Revolutionary Communist Youth, and the Proletären FF (Football Club), together with the Palestinian Progressive Youth Union (PPYU). The first two are associated with the most extremist and Stalinist of communist parties in Sweden. The PPYU ascribes to the most uncompromising Palestinian positions in the Israeli-Palestinian dispute. So, what else is new? There are plenty extremists around. They hold conferences and demonstrate for all kinds of outrageous causes - all part of a democratic, open society. True, but not every public outburst is deserving of government support. In fact, supporting these EU blacklisted terrorist organisations is illegal – something even recognised by the conference agenda. Notwithstanding this, the conference has been subsidized by the Swedish International Development Aid Agency, SIDA – which has donated over 5,000 Euro in support. SIDA has also given 16,000 Euro to conference co-organizer Proletären FF. When challenged, SIDA chose to ignore information about the conference objectives published by the organizers at www.rku.nu, and claimed that it is a "get-together for youth to be able to discuss Human Rights issues". Diaspora Affairs Minister Yuli Edelstein expects the diplomatic crisis over an incendiary Swedish newspaper report to take center stage next week when he meet s with Swedish Jewry in a video conference with community representative. During the diplomatic crisis, which culminated with the cancellation of the upcoming visit to Israel of Swedish Foreign Minister Carl Bildt, many Swedish Jews said they felt trapped between the arguing parties. "I'm sure no one in the community has any doubt that Israel is a free and democratic country that is not capable of doing the terrible things that have appeared [in the Swedish media] recently," Edelstein will tell the community leaders, referring to the Aftonbladet report alleging soldiers had harvested Palestinians' organs. "Jews in Stockholm, and in every other community, should remember that IDF soldiers are not an abstract idea for us. They are our children, brothers, sisters, neighbors. They are not capable of doing the things unfortunately ascribed to them," he said. But the meeting won't be an argument, he adds. "Any Jewish community should always remember Israel as a state is a partner and friend," he said. The meeting is a joint initiative of Edelstein's ministry and the European Jewish Congress' leadel.NET project, an online initiative to foster European Jewish identity through online media. It is headed by Vladimir Kantor, son of EJC president Moshe Kantor. Edelstein will hold an online conversation facilitated by leadel.NET's infrastructure with a different Jewish community each month. In October, he will speak with the community of Sofia, Bulgaria, and in October with Milan, Italy. The "conversations" will focus not only on communal leaders, but will seek to attract young people to discuss Israel with Israeli public figures. Edelstein will invite such figures from academia, the media, government and the military to participate in the discussions. "The congress is working hard to connect communities in Europe to Israel using modern technology. It's time to learn how to use the technology to build new bridges," said Tomer Marshall, managing director of leadel.NET, of the online gatherings. A European Jewish Congress (EJC) delegation called on Bulgarian President Georgi Parvanov [photo] to use his influence to combat calls in the EU to suspend the process of upgrading relations with Israel. "There are unfortunately some discordant voices within the EU who use Israel’s economic development as a political bargaining chip in issues that have little to do with economics and trade," said Moshe Kantor, President of the European Jewish Congress, during a meeting Wednesday in Sofia. In the wake of Israel’s operation in Gaza in January, the EU has suspended the planned upgrade of EU-Israel relations. It said the move will not go ahead until Israel halts settlement expansion and accepts a two-state solution. The EJC said the meeting with the Bulgarian President and high-level members of the Bulgarian government is part of an ongoing effort to promote issues of importance to the European Jewish community with European leaders and to coordinate an organized effort regarding the Iranian nuclear threat. The EJC is a democratically elected representative body of Jewish communities across Europe. Kantor called for a consensus on Iran’s nuclear program: "It is time to act now against the Iranian regime. The European Union must adopt a strict and consistent policy to prevent Iran from acquiring nuclear weapons." "Now that parts of Europe are within Iranian missile range, it behooves European leaders to act quickly and drastically to prevent Iran from terrorizing Europe with these weapons." Kantor said the recent declaration of Swedish Foreign Minister Carl Bildt at the EU Foreign Ministers’ meeting, that "If they (Iran) decide to go for confrontation, then confrontation will happen. It is encouraging, but there needs to be action behind the words." The EJC delegation also called on the Bulgarian government to be vigilant against anti-Semitism and other forms of intolerance and racism, especially in politics. "In Bulgaria, extremist parties should be monitored and legal action should be adopted if they incite xenophobia, anti-Semitism, racism and other forms of intolerance," Kantor said. He added: "There is a growing phenomenon of far-right extremist parties across Europe some whom have managed to gain a foot-hold in the European Parliament, and have used these intolerances, most notably anti-Semitism, as a platform to political power." Kantor also noted that 70 years after the Second World War began, which destroyed whole European Jewish communities; there is a Jewish renaissance in some of these communities. 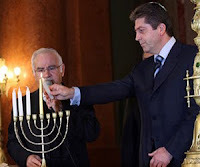 "It is especially symbolic for me to be in Bulgaria at this time, a country that, against all odds and against history itself, managed to save almost 50,000 Jewish Bulgarians from deportation and certain death," Kantor said at a dinner to honour President Parvanov. "For this the Jewish people are extremely grateful to those Bulgarians, including parliamentarians, the intelligentsia, orthodox priests and ordinary citizens who took a stand against tyranny and refused to sacrifice their fellow Bulgarians. Of course we must not forget the fate of the Jews in Thrace and Macedonia, as well as elsewhere, who perished under the Nazis. They must not and will never be forgotten." "If a Palestinian falls over and twists his ankle within sight of Israeli soldiers El País is quick to talk of the thirst for blood inherent in the makeup of the only army in the world that has mostly Jewish members. In this case, however, it reports the story in the most matter-of-fact way and makes no attempt to call into question the Spanish army’s version of events." You remember all the fuss at the start of the year about Israel’s supposedly disproportionate use of force in Gaza, no? Well, unless you are a close student of Afghan affairs it may have escaped your attention that last Thursday Spanish forces killed 13 members of the Taliban without suffering so much as a scratch on their own side. We know that they were members of the Taliban because there were independent NGO or ICRC people on the spot who checked and made sure that none of the dead were civilians who grabbed the family AK47 and stuck their heads outside when they heard the firefight start, don’t we? It’s inconceivable that the Spanish soldiers on the spot might have sought to avoid future embarrassing questions by making sure there was a weapon close to each dead Afghan, isn’t it? Even to hint at the possibility of such a thing would be to stain the honor of a noble army, wouldn’t it? El País of Madrid is the newspaper that reports the story. If a Palestinian falls over and twists his ankle within sight of Israeli soldiers El País is quick to talk of the thirst for blood inherent in the makeup of the only army in the world that has mostly Jewish members. In this case, however, it reports the story in the most matter-of-fact way and makes no attempt to call into question the Spanish army’s version of events. Natalia Junquera and Miguel González, the authors of the report, even manage to give a humanitarian slant to the calling up of a Mangusta attack helicopter to assist the Spanish infantry by saying that it was called off when the Taliban took refuge in caves near to a village with civilian inhabitants. The Mangusta has a three barrel 20mm steerable cannon under its nose as well as a variety of other weapons mounted on pods. A 20mm cannon shell that doesn’t hit its intended target is quite capable of killing a person miles away. It can also penetrate light armor and the walls of domestic residences and kill anyone in the wrong place on the other side. How good that Junquera and Gonzaléz are so certain that nothing like this occurred in this case. Gabriel Albiac has his say on the matter in ABC today. There follows an edited translation of his column. This statement is a bit rich. No other country is so obsessively and negatively covered by the Spanish media as Israel is and the President of the Socialist Spanish party talks of "lack of knowledge". Who does she think she is fooling ? "There is a lack of knowledge in Spain regarding the conflict between Israelis and Palestinians. There isn't a deep understanding of the problems facing the region, and because Spaniards don't know all of the facts, because they don't see that this conflict is not black and white, they can sometimes get into superficial arguments." 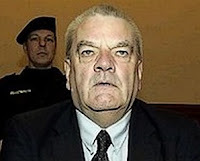 Spain's El Mundo daily should not have run its interview with Holocaust denier David Irving over the weekend, Delia Blanco Teran, president of the Spanish Socialist Party in the Madrid region, has told The Jerusalem Post. Anyone who questioned the Holocaust was "crazy," and "it wasn't correct to write the article," Teran told the Post on Thursday, before the Irving interview ran. "Even in a democratic country, it's not correct to print something like that," she said. El Mundo published the interview as part of a series with "experts" marking the start of World War II 70 years ago. The conservative Spanish People's Party (Partido Popular), which is considered pro-Israel, led the country's government until 2004, when the March 11 train bombings in Madrid helped to bring the PSOE to power. The PSOE's national leader, current Spanish Prime Minister José Luis Rodriquez Zapatero, has been an outspoken critic of Israeli military operations and has made numerous public appearances sporting the Palestinian keffiyeh [photo]. And though her party has not traditionally been considered friendly toward Israel, Teran said that the Israeli public's impression of Spanish sentiment toward the Jewish state had not always been accurate. "The Spanish people are not anti-Semitic," she said. "And I don't think that all journalism in Spain [covering the Israeli-Palestinian conflict] is directed against Israel. The Jews lived alongside the Spanish for such a long time, and I think that a lot of the problems with Spanish attitudes toward Israel are based in a lack of understanding." "There is a lack of knowledge in Spain regarding the conflict between Israelis and Palestinians," she added. "There isn't a deep understanding of the problems facing the region, and because Spaniards don't know all of the facts, because they don't see that this conflict is not black and white, they can sometimes get into superficial arguments." That lack of understanding, Teran said, was the reason for her visit to the region. With help from the the Madrid-based Association for the Solidarity of Israel-Spain, last week Blanco led a delegation of politicians from the Spanish Socialist Party to the region, where they met with Israeli and Palestinian officials and travelled around Israel and the West Bank. While Teran said a large part of the visit was aimed at improving the delegation members' grasp of the problems facing the region before Spain assumes the revolving European Union presidency in January, another goal was to reconnect with Israel's Labor Party, which once had close relations with the PSOE. "When the Labor Party was in power in Israel, we had better contact with them," Teran said. "But now that the Socialist Party is in power in Spain, we wanted to reestablish that connection." Still, Teran emphasized that her group had met with representatives of a number of parties, including the Likud, Kadima and Meretz. "We want to talk to the Israeli government no matter who is in charge, she said. "We also spoke with representatives from Fatah." However, her party had no plans to speak with Hamas representatives. "And while we want to arrive at a solution, and find the resolution to the conflict, our aim is not to tell anybody what to do. We're coming to help - in no way is the Spanish people anti-Semitic. We want to help advance the peace process process between Israel and the Palestinians, and help Spanish society to better understand the issues." The departing chief of the Geneva-based World Council of Churches (WCC) slammed Israel’s "sin against God" in his August 26 good-bye to the world’s largest ecumenical group. "Occupation along with the concomitant humiliation of a whole people for over six decades constitutes not just economic and political crimes but, like anti-Semitism, it is a sin against God," declared Kenyan Methodist minister Samuel Kobia, during his farewell to the WCC’s governing central committee. The WCC was founded after World War II and, in the wake of the Holocaust, robustly denounced anti-Semitism as a "sin against God." Evidently equating the Holocaust on some level with the Israeli presence in the West Bank, Kobia asked his international church audience: "Are we ready to say that occupation is also a sin against God?" On paper, the WCC is important, with 349 denominations as members, representing over 500 million Christians, or about 25 percent of global Christianity. But in truth, the WCC never fully recovered from its 1970’s alliances with Marxist liberation movements. Catholics and most evangelicals do not belong to the WCC, which friends and foes alike view primarily as the voice of declining Western left-wing Protestantism. Olav Fykse Tveit, general secretary in Mellomkirkelig råd (MR), was on Thursday elected general secretary in the World Council of Churches. "We can be proud over how a Norwegian is granted such an important post in the world’s largest ecumenical organization with more than half a billion members, says Foreign Minister Jonas Gahr Støre in a press release. Views "right of return" as "fair"
For friends of Israel and the Jewish state there is reason to grieve. Fykse Tveit supports the Palestinian demand of right to move at least five million Palestinians into the state of Israel. He has over several years been a driving force for presenting this as a “just demand” for the church, both domestically and internationally. If Fykse Tveit had been preoccupied with the right of return for all large groups of refugees, his support to the Palestinians would have been more credible. If it additionally had been correspondingly attentive to a complete vindication and reimbursement of the Jewish refugees from the Arab world, it might even had been fair. But when the demand for rights of return are furthered solely for the Palestinians, and an implementation of this would mean the end of the world’s only state with a majority of Jews, one needs to ask oneself what the driving force is. It is in any case extreme." "Is there any other country in the world that has been as demonized and delegitimized as Israel in Aftonbladet during the last 30 years?" On August 17 Sweden's largest-circulation newspaper, Aftonbladet published an article on a two-page spread on its culture pages which included a disturbing photo of, among other things, a person who had been the subject of an autopsy, Bilal Ahmed Ghanem. In the article the Israeli army is accused of stealing organs from dead Palestinians for use in Israel. Indeed, the article even insinuates that the Israeli army is killing Palestinians for the very purpose of using their organs for Israeli patients. Israeli officials have commented on the picture of the dead man, a wanted Palestinian resistance fighter. According to the IDF, the photo is of an ordinary autopsy. The photo was taken in 1992 (!). Ghanem was killed in a firefight between Israeli soldiers and Palestinian militia. The photograph is the same as the one found in Boström's book Insh'allah from 2001. No new evidence of organ theft has surfaced. This is a very important detail in the context, as Boström has pointed out in interviews that he is not the one suspecting organ theft, but the family he has been speaking to. He assumes the role of mouthpiece for the family. Clearly Boström is lying when he says that the Ghanem family has spoken to him about this. No further autopsies have been performed on Ghanem or any of the other Palestinians allegedly killed. There are no witnesses. Nothing at all to indicate that any crime of organ theft has taken place. The accusations are unreasonable for medical reasons since the organs of people who have been injured or killed by gunshots are unsuitable for transplantations. Per Gahrton, president of the Palestine Solidarity Association of Sweden, told Expressen that he chose not to include the rumors of organ theft in his book "Palestinas frihetskamp", which was released last year: "There isn't enough support? But if the Palestinians are to continue with spreading rumors of the Israelis gathering organs they'll have to show a body that is missing organs", Gahrton says. The head of human rights organization Palestinian Human Rights Monitoring Group, Bassem Eid, is one of the foremost human rights activists in Israel and the Palestinian territories. He, too learned of the rumors of organ theft. Eid could find nothing to support the information. "I have never seen an article like this in any Arab newspaper. No one has reported on this subject - because it is just a rumor", Bassem Eid says. Boström writing and Aftonbladet publishing is certainly due to them their feeling that this is an opportune moment, after the Gaza war and with Israel’s new right-wing government. A corruption scandal has erupted in New Jersey, in which, among many other things, an American rabbi is charged with being involved in the transporting of Israelis to the US in order to sell and donate their organs there. Ergo, it is likely that the state of Israel is party to this foul affair and that these matters are somehow interconnected. Hence the publication value, apparently. Boström and Aftonbladet want a legal investigation into the matter of organ theft. But in a society where rule of law reigns, something both Israel and Sweden are, a prosecutor will only press charges if he/she has enough evidence to convict the accused. Anything else would be a waste of society resources. A court - including the International Criminal Court in The Hague - is not supposed to investigate rumors in a propaganda war. As for the cases invoked by Boström, it's not a matter of "insufficient evidence"; but of "absolutely no evidence". Jesper Svartvik, president of the Swedish Committee Against Anti-Semitism, comments that "the text is an example of criticism of Israel alluding to and mixing in ancient anti-Semitic myths, in this case the medieval myths of ritual murder. Shakespeare’s Shylock can also be sensed in the background, wanting his pound of flesh at any price." Therefore, it is not so strange that Jews in Sweden, Israel and all over the world have taken offence at the article in Aftonbladet. 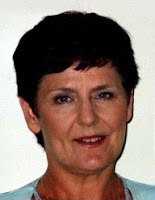 Åsa Linderborg, chief cultural editor, admits that she has never heard of the historical anti-Semitic myths of ritual murder, despite holding a Ph. D. in history ! Now, editor-in-chief Jan Helin would prefer discussing the matter of freedom of speech and the press as well as the forceful Israeli reaction to discussing the veracity of the article or how appropriate it was to publish it. I can understand that, as it enables him to portray Aftonbladet as a victim of Israel's "aggression". Ref. Aftonbladet August 28, with the war headline "Israel attackerar Aftonbladet (Israel attacks Aftonbladet)" at page 1 and references to pages 6, 7, 8, 9, 10. Did anyone say "Exaggerated backlash"? The freedom of information legislation is part of the constitution. No preliminary censoring is to be used. But if you publish a text that is of a dubious nature, you will have to suffer being criticized and questioned. Freedom of speech is not absolute. There is also a law against hate speech, and incitement, although judicial tolerance is extremely lenient. For chief cultural editors and editors-in-chief there is also something called press ethics and standards. The heads of Aftonbladet do not seem to take those very seriously. It is worth studying the publication policy of Aftonbladet regarding Israel over a period of time, and that goes for all of its pages. Is there any other country in the world that has been as demonized and delegitimized as Israel in Aftonbladet during the last 30 years? It is clear that Aftonbladet’s policy regarding freedom of speech and of the press has been completely different concerning, for example, the Danish Muhammad cartoons or Lars Vilks' roundabout dogs (which weren't published in Aftonbladet) a few years ago. AB declined because they didn't want to offend Muslims. But offending Jews and Israelis is apparently fine. I don't think that either Linderborg or Helin were unaware of the ruckus that would be caused by publishing this lousy and poorly substantiated article. I think that they were consciously attempting to push the boundaries of what can be written about Israel and Jews and hide behind the banner - freedom of the press. While it is unethical to invest in Israeli compay Elbit Systems, it is ethical for State-owned Norwegian oil company StatoilHydro to invest in Turkmenistan (Norway suspects Israel unethical, invests in Turkmenistan) Nigeria, Angola and Azerbaijan. And feel good about it. Norway's finance minister on Thursday announced that the Israeli company Elbit Systems Ltd. has been dropped from the Nordic country's pension fund due to ethical concerns. A major optics and electronics manufacturer,the company supplies surveillance equipment used to monitor the security barrier between Israel and the West Bank. "We do not wish to fund companies that so directly contribute to violations of international humanitarian law," said Finance Minister Kristin Halvorsen [see below]. She said the shares were sold secretly ahead of the announcement. Since 2004, a national Council of Ethics has routinely reviewed investments by the fund, and periodically recommends dropping some shares based on a range of ethical issues, including human rights, labor rights, environmental issues and production of nuclear weapons and cluster bombs. "Even freedom of the press, Schutz wrote, had limits. One sentence that was edited out of his letter was his charge that the paper was printing the interview to cause a sensation." El Mundo article will appear a day after interview with Yad Vashem chairman Avner Shalev. First the Swedish newspaper Aftonbladet cited freedom of the press as its justification for accusing IDF soldiers of harvesting Palestinian organs. Now the Spanish daily El Mundo is using the same argument to defend including Holocaust denier David Irving among its list of experts to be interviewed this week to mark 70 years since the start of World War II. An interview with Irving, who served time in an Austrian prison for his Holocaust denial, is scheduled to appear in the paper on Saturday, a day after an interview with Yad Vashem's chairman Avner Shalev. When Israeli Ambassador to Spain Raphael Schutz learned of the plans, he wrote a letter to the newspaper, saying it was obscene to include Irving in the list of experts and give him an esteemed platform. Such exposure, Schutz argued, lent Irving credibility. Schutz's letter appeared in the paper on Wednesday. Schutz wrote that one of the problems facing the post-modern age was an inability to recognize anything as true, saying instead that there were only "different narratives." As such, Schutz wrote, there was no capacity to differentiate between truth and lies, between the important and the superfluous. 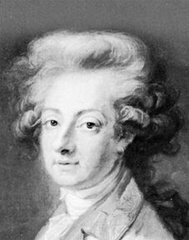 And in this world void of truth, everything is at the same level - the murderer and the victim, the wise and the ignorant, Mozart's opera and the latest pop song. Even freedom of the press, Schutz wrote, had limits. One sentence that was edited out of his letter was his charge that the paper was printing the interview to cause a sensation. The paper's response, which was run under the letter, was not to endorse Irving's ideas, but rather to cite press freedom and the right for everyone to decide on their own.